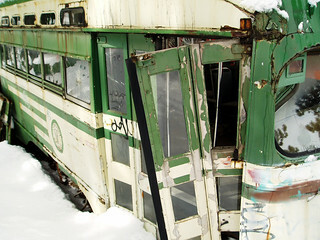 This is the former San Francisco streetcar 1127, resting 200 miles east of the city, in the high alpine snows of South Lake Tahoe. 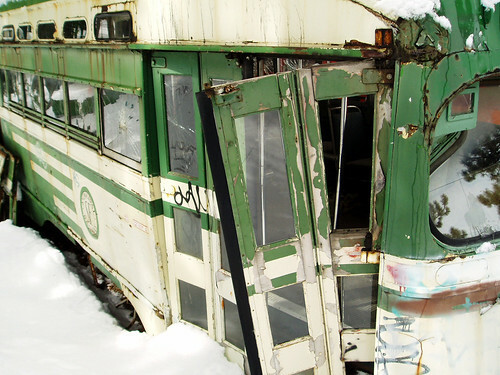 On the blog: "How a Fleet of Vintage Streetcars Became Stranded in the Snows of Lake Tahoe"
A 1970 photo of #1127 in service along Market Street (amid the wreckage of the BART subway construction) can be seen here. This car, and several other PCCs on the property, were purchased as surplus from San Francisco by Gunnar Henrioulle during the 1980s. Henrioulle had hoped to create a restored streetcar line in Sacramento or the Lake Tahoe area. In recent years, however, he's sold four cars back to San Francisco for use on the F Market line, while San Diego also acquired two in January 2006.